Please call us at 866-589-4777 to make a reservation or send us an email with the date of your event, the inflatable and other items you would like to rent, start time of your event, and mobile phone number. A 25% deposit per item will be required for rentals over $400.00 at the time of reservation. Yes, you may cancel due to inclement weather (rain or wind above 15 mph). Cancellations will be accepted the same day unless Jumping Celebrations has arrived at the event, then the full amount will be charged. It is a 6 hour rental rental period. It includes delivery, set-up and break-down of all equipment. However, an additional fee applies for deliveries 20 miles from Metuchen, NJ 08840 and New York. Every mile after the 20 mile radius will be charged $5 per mile. Also, New York rentals are charged in additional $75.00 for delivery. Yes, and a copy of the insurance certificate may be obtained upon request. Q: What are the requirements for the surface area of the set up? The surface area should be about one inch around the size of the inflatable. For example, if you are renting the 5 in1 combo the dimensions are 26’ x 13’. Then you should have an area of 27′ x 14′ that is flat, perferrably grassy, and free of sharp object such as sticks and rocks. Q: How is the inflatable cleaned? We clean all equipment with each use. 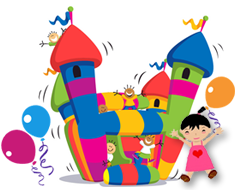 The inflatables are cleaned and sanitized before your event. Q: Could Jumping Celebrations provide an attendant to supervise the inflatable? Yes, for a fee of $25/hr. we can provide an attendant. If you have a standard electrical outlet within 100 feet of the setup area, a generator is not needed. If an outlet is not available you may rent a generator, please see other rentals. Q: How many kids can play at once? Generally, about 4-10 children of the same size/age group may use the inflatable at one time. Each inflatable has its own safety requirements. Yes! The inflatables can be set-up indoors providing there is enough ceiling clearance. Generally, 16 feet vertical clearance is needed. Gyms, auditoriums and other large halls are perfect. Yes, we can; as well as other public places (i.e. church grounds, block parties). However, such set-ups require a Jumping Celebrations Rental attendant to be present due to New Jersey state regulations and is an additional fee of $25 per hour per attendant.